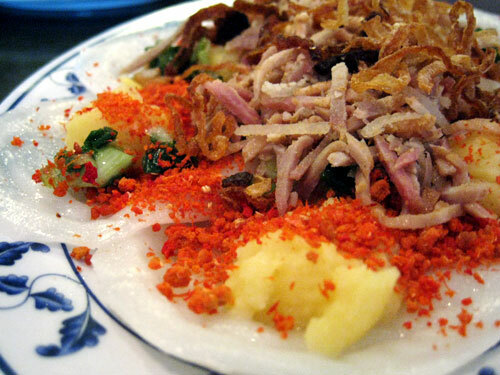 Banh Beo bi, a bloating fern shaped cake with sliced boiled pork skin, has a very special flavor. Specifically prepared from red rice, these pancakes from the Hue region of central Vietnam are mostly served individually in tiny sauce dishes. They’re usually topped with a mix of crumbled dried shrimp, shredded pork, pork rinds, fried shallots and scallions. Refreshing and savory in taste, this Vietnamese delicacy is selected as one of the top 100 dishes of Asia. Comments for BANH BEO BI OF BINH DUONG are now closed.